Oh yay! That time of month again - the Daring Bakers strike again, and the culinary blogosphere is dotted with all manner of adorable frozen cheesecake pops. The pops were this month's challenge, hosted by Deborah, of Taste and Tell, and Elle, of Feeding My Enthusiasms. I was delighted as I did my usual food-blogs-of-the-world tour yesterday evening, as I had the chance to see some lovely photos and some insanely detailed cheesecake-pop decorations. Alas, this month's challenge wasn't meant to be over here at Red Ramekin, and I didn't get around to participating. It's not that I didn't want to try the pops, but honestly, all of that chilling, freezing, tempering, beating, dunking and drying - not to mention the FIVE, yes FIVE (5), packages of cream cheese required for the recipe - made me into a Daring Slacker this month. Besides, cheesecake just doesn't really do it for me. I have a sweet tooth to write home about, but I'd rather sink it into something like cookies, brownies, cake, or ice cream than cheesecake. Next month I promise to make something spectacular, though. In the meantime, I encourage you to check out some of the creations of my fellow Daring Bakers: Jen, as always, serves up the most impressively-photographed pops, with some biting wit on the side. Peabody's pops are so ridiculously cute they should be illegal. And then there's Tartelette, who takes decorating to a whole new level. It's probably better that I sat this one out; there is no way I was taking the time to put rainbow-colored sprinkles and cautious little drizzles on things I wasn't even excited about eating. The second time around, I used non-fat Fage. Still yummy, but not quite as, um, creamy as the first time around. Definitely delicious enough to make again, though, and maybe next time it'll stick around long enough for a photo! The more interesting dish, though, was my submission to this month's Royal Foodie Joust, another blog event hosted by my totally blog-eriffic e-friend, Jenn (aka the Leftover Queen). The premise of the Foodie Joust is this: each month, last month's winner chooses three ingredients, which have to be used in a creative recipe. Bloggers vote for the most creative/delicious entry. I've been wanting to participate in this event for a while, because I love creating a good recipe now and then, and this month I finally got around to it. The ingredients this month were mango, cardamom, and brown sugar. Um, delicious? Obvio. I decided on a mango-sticky rice variant, and created a bruleed, cardamom-scented brown sticky rice with fresh mango slices. I wanted to keep the mango fresh, because we've been lucky enough to find some unbelievably delicious Mexican mangoes at Whole Foods recently. I've also been itching to try sweet brown sticky rice, which seems to be nutritionally indistinguishable from regular old brown rice, but is much more delicate and ever-so-slightly sweet. Some friends came over on Thursday night, and mercifully helped us to devour the yogurt and the mango-rice number. 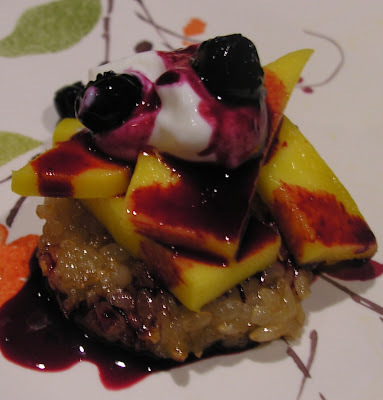 Some nuked and juicy frozen blueberries were the perfect complement both to the yogurt and the mango sticky rice. 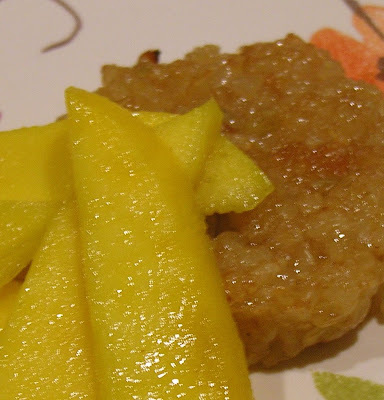 A real recipe isn't necessary for the mango sticky rice, but here is a brief description of how to recreate it: Prepare sweet brown sticky rice in a rice cooker, using a 2:1 water:rice ratio. Add about 6 green cardamom pods to the rice and water before cooking. Once cooked, allow to cool. 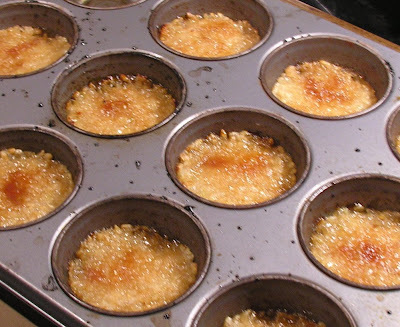 Place about 1/4 c. cooked rice in each well of a muffin tin, and sprinkle tops generously with brown sugar. Place under the broiler until caramelized and bubbly (this happens quickly!). Allow to cool, then remove each rice patty to a plate. Top with freshly sliced mango and your choice of other toppings: whipped cream, yogurt, ice cream, thawed frozen blueberries, etc. I loved the combination of the spiced rice and juicy mango, and have since realized that this "dessert" is actually much healthier than the typical American breakfast. The only added sugar is the sprinkling of brown sugar on the rice, and it includes both whole grains and fresh fruit. Get where I'm going with this one? Serve it for dessert, or brunch, or breakfast...in any case, it is definitely worth a try. The cooked rice also keeps pretty well, so make some the day before you plan to serve the dessert to save yourself some prep time. Hey, I may be a Daring Slacker, but nobody who ate this was complaining. Truly I wish restaurants in general offered desserts like this, it would be a refreshing change of pace. Spiced rice and juicy mango - sounds great! I never tried sticky rice; will have to try to do that very soon.